Last week was my birthday! Was I going to have a big party? No, I was in fact off to the biggest ever European Transformer convention, Auto Assembly. Go me! In my defense, I'd been super excited about this for months. I'd been to conventions before, but not a Transformers one on this scale - a record attendance (over 500 people) and for a full weekend, it would at least be unique. There was also a load of people I knew that were attending, being the perfect chance to catch up with them. And for those that didn't go, shame on you. Friday night was mostly a 'getting to know you' event, with various people milling about. I met up with various people as planned, and took a look at all the wares on the various stalls. They were all set up on Friday night, but couldn't start trading till Saturday morning. And given some of the rather insane deals, predictions of a rush to get in were well founded. Who likes Pretenders? Me! Me! Foolishly I volunteered for the 'fan dub' event. This was a good idea in theory - namely get some people on stage to do voiceovers for an episode. Unfortunately the episode in question was 'The Rebirth' with its six million characters, and no-one really knew what was going on. I shall never look at that episode ever again (and for some reason, all Nebulons go 'MIMIMIMIMIMIMI' instead of talking normally, who knew!). Most people then left for a trip to see Revenge Of The Fallen at the cinema again, but I didn't. Because I don't hate myself that much. Saturday came around, and I got to the hall early, for weekend attendees got in an hour earlier. Or would if the hall opened on time (I'm told this was an issue with the hotel) and there wasn't a gigantic queue. Annoyingly the queue snaked round to the bottom of the stairs, and then started again on the balcony which meant that once the doors opened, there was a mass push of people to get in, and those queuing longest got in last. But that is a minor quibble, it isn't like there was much processing at the door. The main highlight for me was the dealers. Toy dealers of all types had flocked to Auto Assembly to flaunt their wares. And most of them had amazing deals on offer. Best of all was the Toy Fu stall which I was helping out at. A guy called Nick, known as Kayevcee on the TMUK forums had decided to run a stall with all profits donated to charity (Mary's Meals , for those of you interested) By the end of the weekend, he has raised £1,309.06 in profit to donate. That is a staggering figure! Most dealers were just selling modern stuff. But Nick had managed to amass an insane selection of figures, from multiple G1 combiners to complete Pretenders, two Overlords, three Starsabers, two Victory Leos, a sealed Return of Convoy figure, the list went on and on. And his prices were very very good. Needless to say a large chunk of it had gone in the first few hours of Saturday. I managed to resist a lot of the goods on offer, but most of my hard-earned cash was indeed given to Nick. I then spent the rest of the convention helping to sell everything that I wanted to buy so I wouldn't have to spend any more! Saturday night's entertainment was a combination of alcohol, a script reading and the band Next Of Kin. To be honest I wasn't that enthused about any of that, the social aspect was the most important to me and it is generally hard to chat over the noise of a rock band. Despite that, and despite the hall opening half an hour late (due to people constantly interrupting the band's sound tests I am told), Next of Kin actually managed to win me over. They played a decently long concert, over a few hours and covered most of the classic songs from Transformers the Movie. It was nerdtastic. That night I managed to miss the last train home by approximately 4 minutes, so was relegated to using a taxi. Which then drove me several blocks past my house, with me screaming "no no stop oh god stop!" One day I will get a taxi driver who can understand me. I can't really talk about Auto Assembly without mentioning the amazing collection from the Transformers At The Moon site owners. They own nearly every rare Japanese Lucky Draw Transformer in existence, most of them costing thousands of pounds each. And there they were by the stage, in all their chromed glory. Lucky Draw figures are probably a whole other topic for another day, but it was genuinely exciting to see all these rarities in the plastic, as it were. To me, the most interesting ones are not the gold/silver chromed figures, but the ones in odd colours such as Green Unicron and Pastel Energon Prime, all of which were also out for viewing. I am told that transforming these figures for pictures is a very very scary task indeed. And you can't even mash them together shouting 'BOOM BOOM BOOM'! The guests were all pretty ace. There were a lot of them that even I couldn't name (and I am an uber Transformer nerd) but they were all pleasant. One of the revelations was Greg Berger, the voice of Grimlock from the original cartoon. Usually I can't really get too excited over voice actors, but he was incredible, enthusiastic and generally funny. Nick Roche deserves a special mention, for being not only down to earth, a huge trooper (the line for seeing him was about a 3 hour wait) but because I managed to completely forget who he was just 30 minutes after he said hello to me. Sometimes I worry myself. All in all, Auto Assembly was easily not just the best Transformers convention I'd been to, but the best convention overall. There were some minor niggles, but then not everything is perfect. What struck me was the sheer energy behind the entire affair, how there managed to be enough to fit in a whole weekend and leave people wanting more, but perhaps most importantly how nice everyone was. There was a huge social buzz and strangers were just walking around talking to each other like they were best friends. That is something missing from life today generally. "But Matt" you may ask. "What did you spend all your money on?" In the end, I got the above motley collection. Factor in that five of those figures are Botcon exclusives, and you are looking at a pretty penny. But then again, everything I bought was fantastic value. That Sky Lynx for example? £20! Flak? £25! There were dealers in the room by Sunday trying to sell the Ratchet and Ironhide reissues for £15 the pair. But I didn't bite because really, Ironhide? I nearly saved a whole load of cash, but on the very last minute of the convention, just as Nick was packing up his stall and putting the remaining Botcon figures away, I sprung to my feet and declared "no, I shall buy Elita One!" And so I did. And then Nick sold me Razorclaw at the same time, because he is a demon like that! No regrets though, no sir-ee! If you met me at the con and want to say hi, e-mail or MSN me at blueshift2k5@hotmail.com . And yes I know I’m opening myself up for a lot of junk mail, that is just how great I am! Auto Assembly - Homepage of the convention. Next years will be even better (so they say!) so keep checking it out! 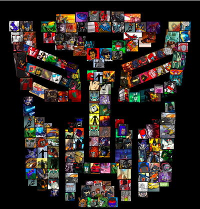 TMUK - UK based Transformer message board and my online hangout of choice. It is a nice forum full of tea and crumpets. Mary's Meals - The charity supported by Toy Fu. Xybertoys - One of the dealers there who was extra friendly and pretty awesome to boot. Special thanks go to everyone who let me use some of their pictures. Since I was a fool who didn't take a camera at all. Below is my piece, entitled 'Up Is Down, Black Is White' with art by the fantastic Bryan Sevilla. Seriously, how good is that art! Below is my piece, entitled 'A Voice In The Dark', featuring the very obscure characters Sky High and Submarauder. Submarauder isn't even named, which is a deliberate choice on my side. I wrote and coloured it, Jake Isenberg did the art, and Mark Kuggeleijn did the lettering. And honestly, it is probably my favourite piece yet, which frustrates me because however much I try, I can't write anything better! Like most kids my age, I grew up reading the delightful Thomas the Tank Engine books by the Rev W V Awdry, and watching the accompanying television series narrated by Ringo Starr about the adventures of the scampish train Thomas and all his friends. Thomas would have adventures where he had to deliver some cargo, or had to deal with a nasty carriage. But there was always that niggling thought - what if Thomas the Tank Engine had not been developed in rural England? What if it had been created in Japan, and Thomas, Percy and James merged at the end of each episode to form an unstoppable robot engine of destruction to crush their enemies? Enter SUPER ROBOT TRANSFORMABLE TOMAS. A good friend of mine, Mark, was working in Singapore and decided to earn a thousand Brownie points by tracking down this marvel of modern science and sending it to me for my birthday. I will post you off a brownie later Mark. When I can catch one. SUPER ROBOT TRANSFORMABLE TOMAS is of course a knockoff. I am sure the estate of Rev W V Awdry have not yet licensed Thomas transforming into a giant robot though it can't be that far off. The package is quite delightfully kiddy, with little clouds and trains all over it. The back promises me trains on fire, Thomas and friends smiling as they perish in burning agony. Sadly you can't actually set the toys on fire, if you do that you just melt the plastic and create toxic fumes. And of course no-one would be stupid enough to do that (apart from me I guess). James is a Really Useful engine. He can transform into a giant robot. Now for the main event, the figure itself. I'm not sure what figure it knocks off, though it looks like it could be a Brave toy, with the heads added of course. Let me know if you have any clue. Being a knockoff the plastic quality is bad, and it make me cry every time I had to push a peg into place or pull one apart. It stands up okay though, and doesn't fall apart at the slightest touch. Make no mistakes, this figure is cheap as hell. But I have had worse, and let's face it, the reason this is awesome is not because it is a quality figure, but because it is Thomas and friends combining into a super-robot. Interestingly, note that Thomas is just an arm and James is the main body. Originally Thomas was just another character, Rev Awdry only later being forced to make him the main focus of the books by his publisher. Perhaps this is the toy makers paying tribute to this notion, having Thomas not be the focal point of the figure. Or perhaps they just threw whatever colours they had lying about into the plastic vat. In my head, this guy has the voice of Ringo Starr. As a Transformer, the figure is pretty lacking too. The various trains don't have their individual robot modes, just the combined form. They also each separate into 2-3 parts and plug together, rather than fold in any clever way. But again, I have Masterpiece figures for clever transformations. Masterpiece Megatron doesn't look like the Fat Controller after all. Here are Thomas, Percy and James in all their glory. They all look pretty decent, though Thomas and James have got the wrong colour bands behind their heads (other versions have this band painted black, I guess they ran out of lead for the paint pot). James is also called 'Daisy' Which I imagine will give him some issues. The three can also link together in train mode, so they can shuffle off as one and have adventures! Choo choo! Choo choo! All in all, this is a brilliant set, wonderful in its sheer insanity. 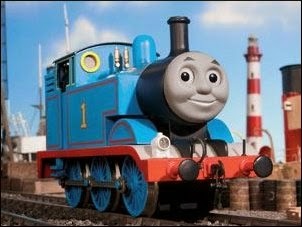 When I was little I didn't have a Thomas the Tank Engine toy - I did have a blue train which my mum stuck a smiley face sticker onto the front so I could pretend it was Thomas. If I had this, it would have made my world! Until I chewed the paint and died from lead poisoning I imagine. Research has shown there to be even more Super Change Tomas toys. Take a look at them here.